This fresh, premium, Granny Smith apple is dipped in our buttery caramel, hand dipped in explosive milk chocolate and fresh pecans. 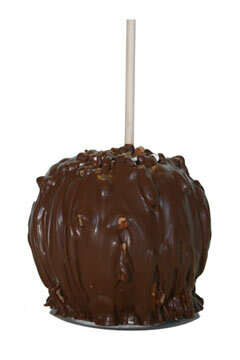 Topping off this beloved treat is a second layer of milk chocolate for the ultimate Gourmet Apple experience! This kind of apple is out of this world! I am so glad I got to know this place, Gourmet Apples ! I CRAVE these apples! I've tried just about every gourmet apple from different web sites and local shops. These apples from this site are by far my favorite! So delicious! Thanks so much for the great quality. Well worth every penny!